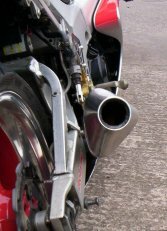 We are Midlands based manufacturers of handmade stainless steel motorcycle exhaust systems, silencers and associated components. Our silencers and complete exhaust systems are typically designed and built to each individual motorcycle and thus we may need your motorcycle for a short period of time for test fitting etc. Regular and previously manufactured products may be available from stock. Our systems provide you with no performance loss. Race cans tend to add to the top end power however they generally reduce the low end power and are a pain in traffic - ours are not!